Something insanely lush for you to covet – you may thank me later. This is the Rouge G l’Extrait from Guerlain, an entirely faultless lipstick encased in something that can only be described as a work of art. Now I know that Guerlain are known for their fine packaging, but I can’t adequately describe to you the joy that I felt when I gave the heavy lid a twist and a mirror smoothly opened along the length of the casing. I felt as though I was in one of those futuristic movies where they pass the baddy the controls to the nuclear weaponry! Everything felt so sleek and heavy and NASA-engineered! I’ve digressed about as far as I reasonably can on this one, so let’s get back to mission control: this is one amazing lipstick. It’s not even strictly a lipstick, it’s a highly-pigmented liquid colour with a non-sticky, non-gloss finish. I’d say that it had a matte finish, but I don’t want you to think that it’s in the least drying, so I’ll stick to “non-gloss”. 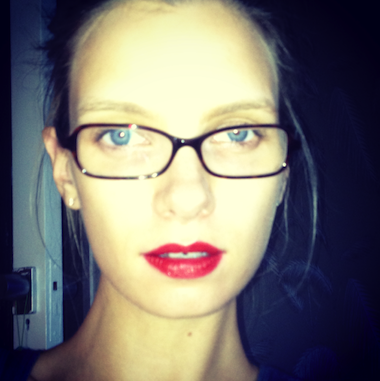 I have the shade Luxure, and you can see from the geeky glasses picture below that it’s a rich, bright red – it’s a LOT redder and brighter than any of the official images let on. It’s a real red-red, a Hollywood Starlet Red. 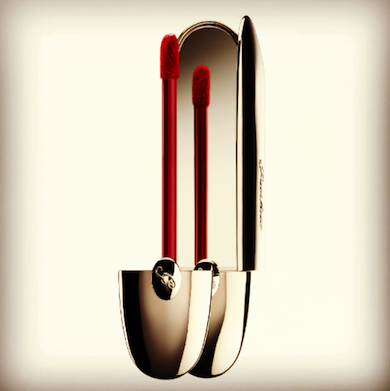 This is grown-up makeup at its very best – owning one of these Rouge G l’Extraits is a bit of a rite of passage, in a way. You really couldn’t get very much more sophisticated. One of these would make a great 21st birthday present or graduation present if you were looking for something chic and covetable – actually, one of these would make a great present full-stop! Refillable, beautifully made, eternally stylish; this is a true beauty investment that will stand the test of time. Next Post How to Treat Dry Feet….continued.